Ho Ho Ho! Merry Christmas and Happy Holidays! Where’s Santa? Have you seen a jolly gentleman dressed in red with a white beard and carrying presents? Is he at the mall, a farm, zoo, theme park, or Winterfest? Where oh where can he be? Do not despair, Santa’s reindeers are equipped with nature’s own GPS system so Santa always know where to go. Please confirm dates and times as they are subject to Santa’s hectic schedule. Christmas Village with winter wonderland activities and photo-op with Santa. Christmas Light Show with 2 million lights on a mile long drive through course. Santa Claus will make his way from the North Pole down to Sahara Sams. Enjoy a tasty breakfast buffet and snap photos with Santa. He will put on a Santa Swimsuit & join the kids in the waterpark till 1pm. Enjoy games, fun rides, laser tag, go-karts, and thrills at iPlay. Take photos and meet Santa at iPlay every weekend through December. Free. Continuing their Christmas tradition, Santa is spending time at Abmas's Farm before heading back to the North Pole. Visit with Santa and Mrs. Claus and get in some photo ops. Meet Santa, take photos, and enjoy a hot breakfast aboard the awesome Battleship New Jersey. Meet Santa and make ornament crafts. Skate and take pictures with Santa at the Woodbridge Community Center. Hot chocolate provided with every admission. Get ready for some Christmas Cheer at Liberty Hall Museum. Take a photo with Santa in his sleigh. Reserve your hot breakfast buffet now. Santa appears in his chimney at 5pm, waves his magic wand and lights Storybook Land with over one million lights. The Holiday Bazaar will feature shopping from handcraft and vintage vendors, photos with Santa on Sundays, 30 foot Christmas tree, live music, kids art classes, food, holiday workshops and so much more! 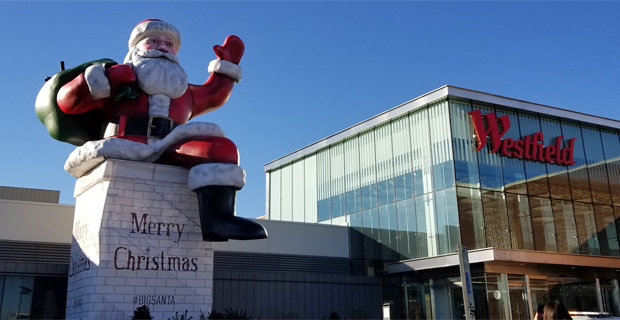 Coming back to Bergen County is Big Santa, a 45 feet tall replica giant Santa Claus. He’ll be illuminated and hanging on top of a chimney in the parking lot adjacent to Nordstrom. Visit the Morristown Green to meet Santa and take photos, enjoy holiday treats, and ride a miniature Electric Train around the Green. Month long Winter Wonderland experience! The most wonderful time of the year as Scuba Santa swims back into town to take selfies with kids. Be on the lookout for the World’s tallest and smallest underwater Christmas trees. Guests will be treated to daily live programming and more. Take part in Philly’s authentic German Christmas market at LOVE Park with shopping stalls, twinkling lights, festive decorations, and music. Visit Santa and take photos with him in his own house at Christmas Village. Come meet Santa at Holiday in the Park at Six Flags. Millions of glittering lights, dazzling holiday entertainment, delicious treats, Santa’s village and many popular rides are transformed into a winter wonderland. The elves are clearing Santa’s calendar. Santaland is by reservation only. Macy’s wants to make sure that each child has an amazing Santa experience. As you wait in line, you’ll be able to see all of the Santaland village attractions. Meet and greet Santa Claus. Also free admission to view the Holiday Lights Spectacular. Bring non-perishable donation. Visit Short Hills Mall and participate in Santa’s Flight Academy. Each child becomes a member of the flight crew and enjoys a special visit with Santa. Your child can receive a personalized Cadet Badge, try on a virtual flight suit, learn how to operate the sleigh, and dance under magical lights and snowfall. Photo-op with Santa and Mrs. Claus, Santa mailbox drop, arts & crafts, treats, much and animals. Free photos with Santa at Jenkinson’s South Arcade. The Jersey Shore comes alive as indoor holiday lights brighten up Jenkinson’s Aquarium & Pavilion. Winter wonderland with treats, pictures with Santa, games, and more!